DASHER New Edition – Gaming Mouse Pads – the new 3 sizes (DASHER MINI SLIM, DASHER MEDIUM and DASHER EXTENDED) of our smooth surfaced DASHER mouse pads give gamers an enhanced design for your mouse and different sizes to accommodate both low sensitivity and high sensitivity players! Tt eSPORTS’s Speed-type mouse pads are incredibly smooth and flat. It allows gamers to have precise movements with comfortable feeling (FPS & RTS & MMORPG Games). Speed-type mouse pads best suit gamers who need to hit targets faster and more efficiently! A smooth surface designed to allow you almost effortless mouse movement. 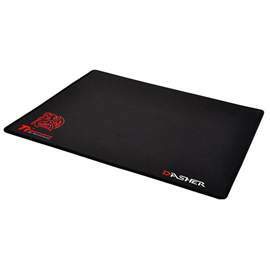 DASHER new edition mouse pads deliver excellent glide characteristics that offer total tracking responsiveness for consistently reliable in-game control! A special non slip rubber base ensures that DASHER New Edition mouse pads will never slip as you game, even in the most intense of battles. Play with confidence and never worry about mouse pad lift-off or slipping again – even on glass desks!